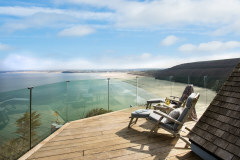 Cornish Gems are thrilled to offer Compass House for luxury holidays in St Ives. 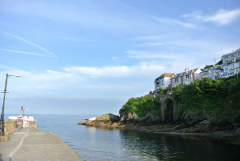 This stunning detached Edwardian villa has been totally renovated and refurbished throughout to create a superior beachfront holiday home directly overlooking Porthminster beach. Compass House can accommodate up to 6 guests and boasts a beautifully landscaped, terraced front garden as well as a spacious sun deck for you to soak up the spectacular views across the bay. A parking permit is provided with the property. Once inside Compass House there is a wonderful aura of light and space combined with a nostalgic Edwardian feel as many of the original features have been cleverly recreated and combined with a modern touch of magic. The beautiful living space at Compass House includes a sunny sitting room complete with Edwardian style wooden paneling. The former Edwardian veranda is now enclosed to create an incredible dining area with modern, circular dining table and chairs perfectly placed in the window to showcase the views. The ship shape modern style kitchen includes all modern appliances and equipment you'd expect in a home of this standard. 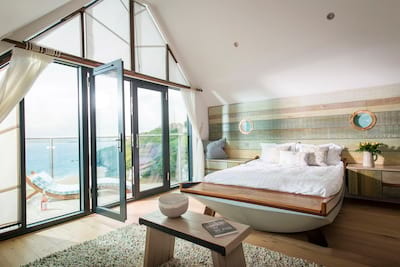 Sumptuous sleeping accommodation offers three double rooms with luxury beds not least the 'tower' bedroom with enormous double aspect windows showcasing one of the best views in St Ives - awake to the azure blue seas from your pillow! With a subtle fusion of salvaged finds, antique and more modern furniture, this really is first class coastal chic. The views from Compass House really are unrivalled. 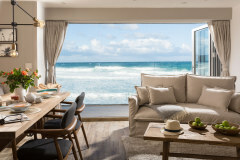 Its slightly elevated beachfront position offers relaxing views across Porthminster beach framing the picture-perfect view of St Ives. 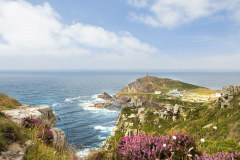 Far reaching views lead you across to Godrevy Lighthouse, Gwithian and right up the north coast. 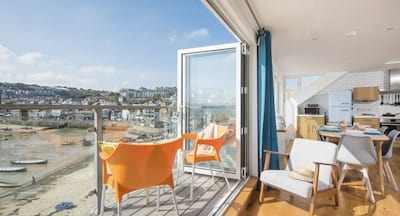 The location is second to none, steps lead up from the beach (near the Porthminster Beach Cafe) to the beautifully landscaped terraced front garden and path leading to the former Edwardian veranda. To the rear, the back door leads from the kitchen to the elevated sun deck and outdoor dining area with table, chairs and sun loungers - a lovely area to enjoy a holiday cocktail or two. The views from the deck are equally as wonderful - glimpse over to the Porthminster Beach Cafe's vegetable and herb garden and you may even see one of the chefs selecting their fresh daily harvest - this much acclaimed beachfront eatery really is worth a reservation. 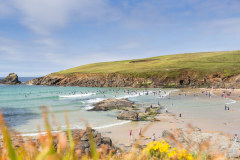 With two beach cafes, beach shop, a 'pitch and putt' course and ice cream parlour, your Cornish beach holiday starts here. The beautiful and buzzy St Ives town is a few minutes walk away with its cosmopolitan restaurants, boutique shops, pubs, bars and art galleries (including The Tate and Barbara Hepworth). With the St Ives branch line station within walking distance from Compass House, it is a perfect choice for those city travellers that wish to travel by train. The 'tower' bedroom (ist floor) offers a 4ft 6" double bed, antique writing or drawing table, bedside lighting along with enormous double aspect windows showcasing those simply wonderful views. Wake up and see the beach and St Ives from your pillow! Quintessential main bathroom complete with white metro tiles, quality sanitary ware and Lefroy Brooks nickel plated fittings. 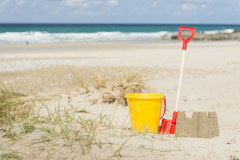 A pre-paid parking Rover ticket for one vehicle is provided when you book Compass House, which can be used in any of the local council long stay car parks in St Ives (one of which is just 2-3 minutes walk away - The Station car park). You will need to give your registration number to the team when you pay the balance so that it can be purchased for you). 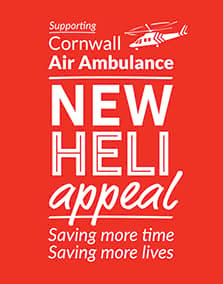 Please note a parking space is not allocated but it is a fairly large car park and there are 5 other long stay car parks in St Ives available if required. 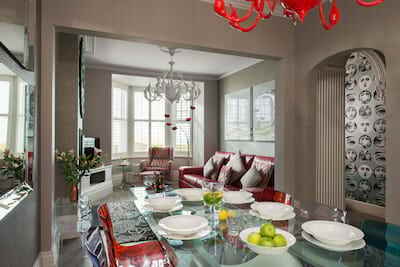 Compass House is situated in a superb beachfront position in St Ives. Due to this central position guests may hear the morning waste collections from nearby establishments. This property is all about location - and it delivers!! Thanks for the house we had a great time there. 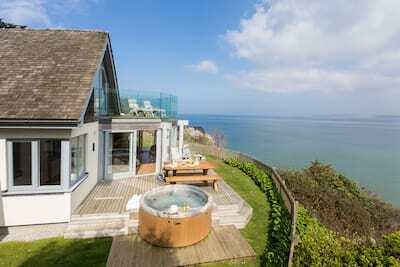 Compass House is an amazing property with an amazing location and beautiful views. The house is lovely and in a marvelous situation. Our stay was extremely enjoyable. 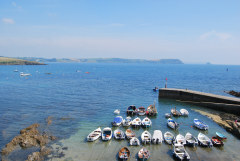 The setting and cottage are perfect for a family getaway close to a lovely beach. The house and its position were marvellous. This is an amazing property in a perfect location. Brilliant customer service and a fantastic property. The house was amazing, great location and very well equipped. We all had a great holiday. Thank you. The property was lovely and in an unrivaled location. 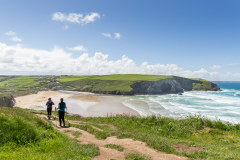 Cornish Gems were a brilliant company to deal with, and we had a wonderful stay. Thank you.